What Do You Like, and Why? 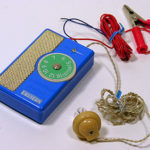 The first commercial transistor radio, the Regency TR-1 was made in America, and came to market in time for Christmas, 1954, but experimenters were making homebrew sets several years earlier. 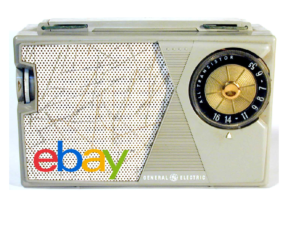 As we age, the “collectible” timeline will creep up, and there are already folks collecting childhood radios from the early eighties. You will find avid collectors in America, Japan, and worldwide. There are many European collectors, and Australians love the hobby as well. 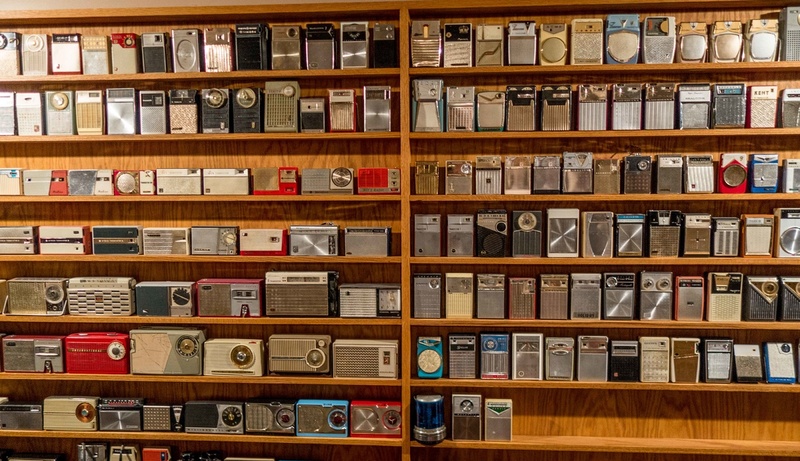 I now know lots of wonderful collectors, a few of them first-hand, but many more as the result of Internet correspondence It seems to me that all boomer-aged radio collectors have a few things in common, but they usually fall into perhaps seven different niches. See if you can recognize yourself in one or more of these descriptions. This “self-examination” might help you better-focus, or perhaps broaden your collecting efforts. Period enthusiasts are not transistor radio collectors in the traditional sense. They might own a radio or two from their childhoods, but probably also collect mid-century furniture, toys, pop culture posters and so on. They are as in love with the time period as they are with any particular radio, or radio manufacturer or whatever. Period collectors tend to own a few, working, dramatic electronic pieces that fit into a broader household theme. 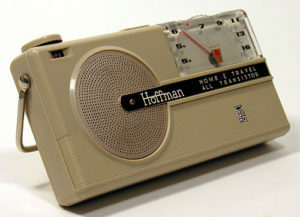 Mostly, but by no means exclusively men, electronics lovers typically have quite a few transistor radios, but they might also have vintage HAM gear, test equipment, early hi-fi and stereo systems, extensive technical libraries, and perhaps even home-brew projects and collections of unused vintage components. It’s not unusual to find both tube and transistor gear in their collections, which sometimes spread into both earlier and later decades to embrace old, vintage hearing aids, early computers, electronic pocket calculators, and so on. These are, to me, some of the most interesting folk. They pick a particular, very specific niche and nearly obsess over it. Some specialists collect only shirt pocket transistor radios. Others specialize in a particular manufacturer’s sets—Sony or Zenith, for instance. 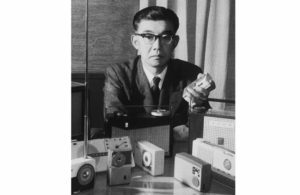 Some want only Japanese radios or just American made sets, or American brands that were made in Japan. 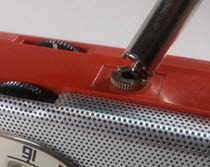 Others become interested in a family of products—Zenith Trans-Oceanic radios for example, be they tube or transistor. There are a number of collectors who specialize in the Regency TR-1. 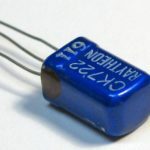 More than one specialist knows nearly everything there is to know about Raytheon CK-722 transistors, a single component that created an entire hobbyist industry that lasted for decades. There are amateur radio, (HAM) specialists, Novelty radio specialists, crystal set lovers, folks who collect only ephemera—books, schematics, store signs and so on. A few of these folks use their collections to re-live their professional lives. Since they worked at a particular electronics company—Texas Instruments or Olson Electronics, for example, they have vivid memories of products, projects, coworkers and even their workplaces. Because of their “insider” status, many have amazing libraries of old sales literature, in-house memoranda and other items of historical value. These folks tend to be our hobby’s unofficial historians, and an important, fascinating part of the collecting community. Historians are like Specialists on steroids. They want to gather, catalog and preserve all the details for future generations. Many enjoy publishing their findings, and exhibiting their artifacts. They want to know when the first prototype of a particular set was built, the serial number of the first unit shipped, how many were , which countries imported them, and so on. Historians catalog the smallest changes in components, circuitry and cabinetry over the lifespan of a product. They want to gather and study advertising pieces, press releases, company correspondence with dealers and all manner of ephemera relating to particular radio or manufacturer. They record aural interviews with people involved in the companies and products they study. Sadly, our little sphere of interest (mid-century electronics) has only a handful of true historians, and fewerexhibitions. Even the Smithsonian, which I was told has an amazing collection of boomer-era electronics in its storage area, has very little on display. I haven’t been there in a few years, but during my last visit there was literally one dusty little case with a Regency TR-1 and some other (unmemorable) bits and pieces scattered around it. I have seen better looking high school science projects. The wonderful private radio and broadcasting museums around the country, (and there are a dozen or more), largely ignore the era as well. This is likely because we boomers are not actively involved with these valuable, almost always non-profit, volunteer organizations. Until we roll up our sleeves, and put our money and time into helping create displays there won’t be any. So, if you think you might enjoy being a historian, or at least helping one, please drop by your local museum and see what you can do to get our generation’s technology on display. Start by helping our parents and grandparents preserve their artifacts, and help them get interested in our “little plastic radios.” We need more historians! I might be one of these guys. I get a big kick out of making an old piece of electronic gear work again, and enjoy making it look better too. I find it interesting to peek inside and marvel at the variety of technical solutions engineers employed over the years to do everything from pulling in radio waves to moving tuning dial indicators to holding batteries. For us half the fun is found inside the things we collect and disassemble. The other half is making the outside look as close to factory fresh as possible. We restoration nerds typically have more than one workbench, piles of old “parts” sets, smelly chemicals, dirty rags, tools galore, musty service documentation. Squawks and squeals come out of our workshops at all hours of the day and night. It’s a wonder our families put up with us. As the name implies, they expect everything to be factory-fresh when they acquire it, something that is harder and harder to achieve now that a lot of boomer-era collectibles are more than fifty-years old. I once sold, on eBay, an incredibly rare transistor radio. It went for several thousand dollars less than it should have. This radio was perfect in anybody’s book. Or so I thought. I went to great pains to pack it carefully and it arrived safely. But instead of my getting a gushing “Wow, thanks for offering this amazing radio” email like those I often get when one of these rare items goes for a song, I got a message from the perfectionist/winner saying in part that “if one looks very carefully under a magnifying glass at the plastic feet on the bottom of the radio, one of the feet appears to be slightly rounded off.” He wasn’t sure if it came like that from the factory or what, and wondered if I knew. Perfectionists also usually want unmolested, playing radios containing only original factory parts. This will be more and more difficult to accomplish as the electrolytic capacitors in virtually all mid-century electronic devices will eventually dry out, leaving all collectors with the unfortunate dilemma of keeping our artifacts factory fresh, or replacing parts in order to return them to operating condition at the expense of authenticity. That’s going to be a really difficult decision for perfectionists. I wonder if it will result in a mini-flood of cosmetically perfect, dead radios for sale on eBay? Please don’t misunderstand me here. Seeking excellent examples of artifacts is a very important part of collecting. But not everything that rolled off of an assembly line 50-years ago was perfect when it left the loading dock, let alone after years of use and abuse. Perfection is great when you can find it, but items in excellent and even very good condition can be equally enjoyable for most folks. If you crave perfection, be extra careful when you shop, and ask lots of questions. See comprehensive photos, or better yet hold the item in your hands before you purchase it. And be sure you buy only from sellers with liberal return policies. You need to also face the reality upfront that if your definition of perfect includes working the day will come when nothing in your radio collection will be perfect. I personally find it fun to discover and wonder about the occasional ding or dent, and a previous owner's Social Secrity number etched on the bottom of a set. You know at least one of these folks. Perhaps you are one. I have been accused of skirting the edges of this lifestyle myself. Sometimes referred to as pack rats, insatiable shoppers acquire and pile, acquire and pile some more. Much of what gets purchased never sees the light of day. It’s squirreled away in bankers’ boxes in the garage, and perhaps in the hallway and in the guest bedroom closet. Not all pack rats are collectors. I once had the both delightful and depressing experience of walking into a shuttered-up sixties-era radio store that had been owned by a recently deceased shopkeeper. He had locked the door in the mid-sixties leaving behind not only quite a few new-in-the-box radios from the era, but also heaps of abandoned service projects, piles of Heathkit catalogs, manufacturers’ marketing materials, and what appeared to be every nut and bolt and bottle cap he had ever owned in his life. It was now up to his heirs to dispose of what was mostly, but not completely hazardous waste. It has made me re-think that pile of boxes in my garage. How many “parts radios” does a boomer need? Will we be leaving our survivors a legacy or a nightmarish disposal chore? So, again, as we expand our collections, perhaps we should all consider focusing a bit. Here are some questions to ask ourselves. Hobbies ought to be all about discovering what we enjoy and doing more of that and less of something else. Japanese? American? Fifties? Multi-band? Crystal sets? 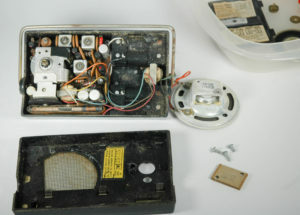 Two-transistor "Boys Radios? What? Fix or Just Display Them? Do you like fixing things, or mostly do you prefer showing them off? 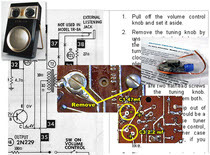 And incidentally, just because you don’t know how to repair radios doesn’t mean you can’t learn. That process itself can be fun, and you can leafrn a lot about ig here on this site. So before you say “I don’t know a resistor from a thermometer,” ask yourself if you would like to learn how radios work and how to fix them. You might be surprised at how easy it is and how much added enjoyment the troubleshooting process can provide. Do you have a place to work? If you plan to repair and clean vintage electronics give some thought to where you will work. While many boomers are downsizing as their nests empty some of us are turning empty kids’ bedrooms into hobby rooms. The third parking space in a garage can become a nice workshop, especially if insulated, heated and air-conditioned. Learn more HERE. Many retirement developments such as the ones built by Del Webb and numerous other developers have community centers complete with well-equipped workshops. If you are shopping for new digs keep your hobbies and those of your spouse in mind. Don’t downsize the fun just when you get the time to have some. Also check out the new Worker Spaces popping up everywhere. 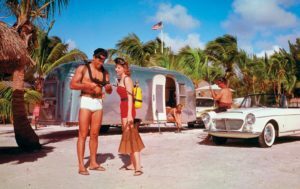 I even know a guy who repairs radios while on the road in his RV. The nice thing about transistor radios is that they don’t take up much room. We have touched on this already. Are you mostly looking for that radio you had as a kid, or wish you could have afforded back then; or would you like to know everything there is to know about radios sold by Sears Roebuck in the sixties? 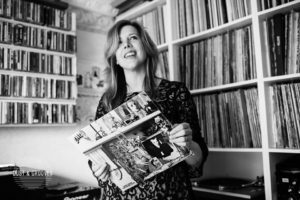 Would you like to plunk the needle down on an old Beatles LP and bask in the glow of a vintage tube stereo while you polish up an old pocket radio? ‘Wish you had an eight-track player for your vintage Mustang? How would it feel to talk with astronauts in the space shuttle using a vintage Heathkit transceiver? Just because you don’t have a HAM license doesn’t mean you can’t get one. And no, you don’t need to know Morse code to become an amateur radio operator. This might be the thorniest issue of all. The amount of space you have available for display and safe storage might affect the type of collecting you can do. If you don’t have a lot of space, or if your spouse thinks “those old things look like junk,” you will need to get creative, and perhaps selective. I've written a few tips on how to safely, attractively and compactly store your collection. A good starting tip is to only collect a few really nice items at first rather than a lot of mediocre pieces.